Behold the new era! Introducing [G guardian]! * Effective from May 20, 2016. What’s Great About G Guardian? POINT 1A powerful card with 15000 Shield that can be used when conditions are met! G guardians called to guardian circle work in the same way as normal guardian. The power of the unit being attacked increases by the Shield of the G guardians. Compared to a normal guardian card, a G guardian has a larger Shield value, and also has additional abilities. It is a super strong guardian. POINT 2 G guardian helps fulfill the conditions for activating GB! At the end of the battle, the G guardian is put into G zone face up. Face up G guardians in the G zone also count towards fulfilling the conditions for the Generation Break (GB), so it will now be easier to activate GB! Both fighters are at grade 3 or greater. You have a heal trigger in your hand. Do take note of this for G guardian! When you have 4 face up G guardian cards in your G zone, you cannot use G guardian in that fight. G guardians are placed face down in your G zone with the other G units, before the cardfight begins. Put 1 heal trigger from your hand to drop zone as the cost. Call a face down G guardian card from your G zone to the guardian circle at rest. At the end of the battle, the G guardian is returned to G zone facing up. 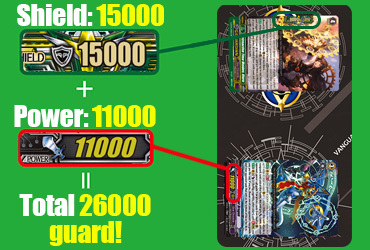 Now you can master G guardian and enjoy cardfight! G guardian will be featured in Fighters Collection 2016! Cardfight!! 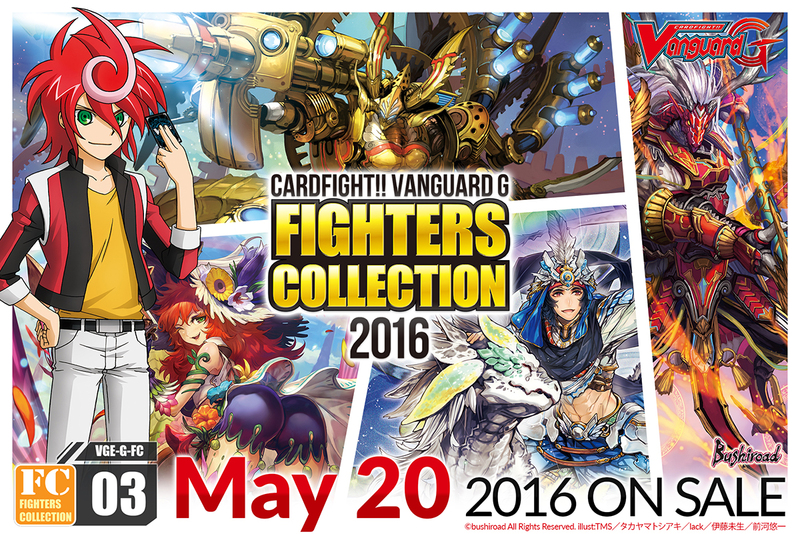 Vanguard G Fighters Collection 2016 on sale from May 20, 2016 will feature G guardians for all clans! What is a G guardian? 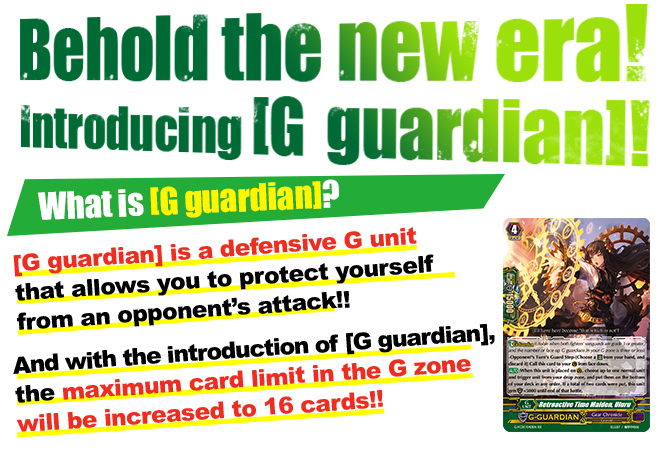 A G guardian is a G unit with the ability to be placed on the guardian circle during your opponent’s turn. When your opponent’s unit attacks, you may discard 1 heal trigger from your hand and call a face down G guardian cards from the G zone to guardian zone. Can I include as many G Guardians as I wish in my G deck? Yes, you may include any number of G guardians as you wish in your G deck, as long as you do not exceed the maximum of 16 cards in your G zone. However, you can only have up to 4 cards with the same card name. When can G guardians be used in tournaments? They can be used from May 20th, 2016 onwards. When my vanguard is at Grade 3, can I call a Grade 4 G guardian? Yes, you can. Calling a G guardian is not counted as a normal call, you can call it even when your vanguard is at Grade 3. What happens to the G guardian on the guardian circle at the end of the battle? It is placed into the G zone facing up. It does not go into the drop zone. When considering the number of face up G units in the G zone, is the number of face up G guardians also considered? There is 1 face up G guardian in my G zone. Are the GB1 abilities of my units valid? Yes, they are. As G guardians are G units, the requirement for GB1 is fulfilled. If there is 1 face up G unit in my G Zone, and 1 G guardian on my guardian circle, is the requirement for GB2 fulfilled? No, it is not. GB counts the number of face up G units on your vanguard circle and G zone, but does not count the G units on your guardian circle. At the end of the battle that the G guardian was called, the G guardian returns to the G zone face up, and the condition for GB2 will be fulfilled from then on. Can I pay the cost and Stride a G guardian during my turn’s Stride step? No, you cannot. G guardians do not have the “Stride” skill, and so cannot be stridden during the Stride step. Can a G guardian attack? G guardians do not have any ability to be placed anywhere other than the guardian circle, and therefore, cannot attack. For units such as “Legendary Dimensional Robo, Daikaiser Leon” with effects that choose up to one of the opponent’s guardians and retire it, can the effect retire a G guardian? Yes, it can. In that case, the G guardian is directly put into the G zone face up. It does not move into the drop zone. Can I call 2 or more G guardians during a single battle? Yes, you can. If you pay the cost, you can call 2 or more G Guardians in a single battle. For units such as “Dark Dragon, Phantom Blaster “Diablo”” with effects that prevent cards from being called to the guardian circle from hand, can I call a G guardian? Yes, you can. As the G guardian was not called from hand, you can call it. For units such as “Silent Tom” with effects that prevent Grade 0 cards from being called to the guardian circle from hand, can I still use a heal trigger as the cost to call a G guardian? Yes, you can. As it is put into the drop zone as the cost, it is not considered as calling a Grade 0 to the guardian circle. During the battle where my “Sunlight Goddess, Yatagarasu” was attacked, I called a G guardian. At the end of that battle, can I put the G guardian into my soul? No, you cannot. As the G guardian is not put into the drop zone and is put into the G zone facing up, the AUTO ability of “Sunlight Goddess, Yatagarasu” does not trigger. Can I turn a face up G guardian in my G zone to face down with the ability of “Wakey Wakey Worker”? Yes, you can. As a G guardian is a G unit, it can be turned face down. Can I call a G guardian when my vanguard is deleted? If both fighters’ vanguards are at Grade 3 or greater, you can do so. However, unlike when you Stride, when you call a G guardian, your vanguard is not turned face up. Can I put cards other than heal triggers to the drop zone when paying the cost to call a G guardian? No, you can only put a heal trigger to the drop zone for the cost. When I add a card to my hand with G Assist, and need to remove face down G units from my G Zone, can I choose to remove G guardians? Yes, you can. As the condition to use G guardian is “the number of face up G guardians in the G zone is 3 or less”, the G guardians that were removed are not counted towards that condition. When there are 4 face up G guardians in my G zone, and heal triggers are returned to my deck from the drop zone by Legion or other effects, and I draw a heal trigger once more. Can I call a G guardian? No, you cannot. As the condition to use G Guardian is “the number of face up G Guardians in the G zone is 3 or less”, you cannot call G guardians. If a face up G guardian in the G zone were turned face down by some method or another, it would be possible to call G guardians 5 times or more in a single game. Is the number of times G guardian can be used in 1 game restricted to 4 or less? No, the number of times can be more or less depending on the situation. If a face down G guardian in your G zone was turned face up by the ability of another G unit, the number of times you can use G guardian is reduced. And, if a face up G Guardian in your G zone were turned face down by an effect that turns face up cards in the G zone face down, the number of times is increased.